wanderlust ATLANTA: Zombies, Awesome Zombies! 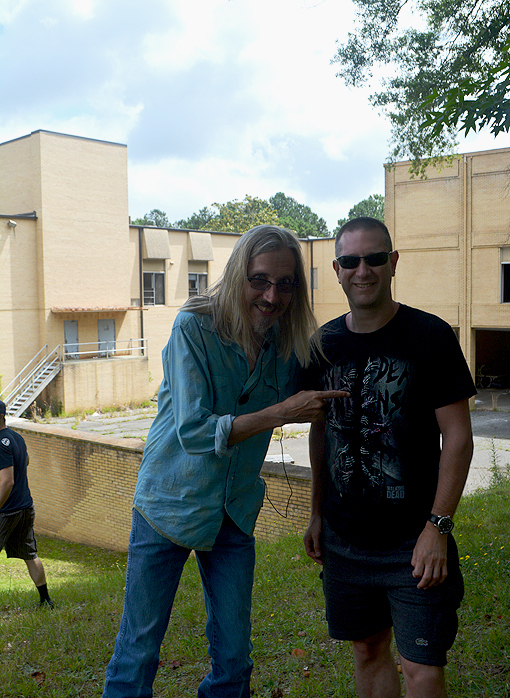 I've now been on four of the five tours offered by Atlanta Movie Tours and recently went on both of their Big Zombie Tours...on the same day! There's a LOT going on in the Zombie Apocalypse, too much to cover in a single post, so this post will focus on Big Zombie Tour - Part 1, which I've now been on twice! Based on the country's most popular television series, EVER, both Big Zombie Tours focuses primarily on The Walking Dead, but you'll find yourself quite fascinated with other movie trivia—sites included—throughout the tour. 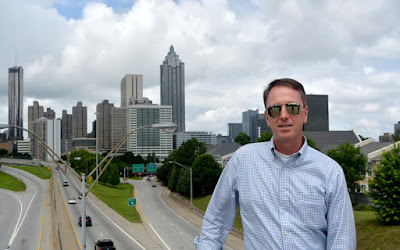 One of the perks of your tour with Atlanta Movie Tours is an awesome souvenir photo(s) with your fellow tourees at a site specific to the tour you're on. I love this one at Jackson Street Bridge, the iconic scene where Rick enters Atlanta on horseback in Season 1, Episode 1. 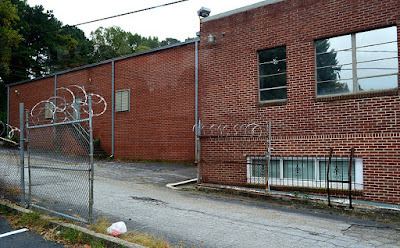 The Atlanta Movie Tours brick-and-mortar shop, the originating locale for Big Zombie Tour - Part 1, is in Castleberry Hill, a downtown-adjacent neighborhood that has seen spectacular growth over the years, while keeping a neighborly feel. I've attended a couple of Castleberry Hill events, so I know from personal experience. 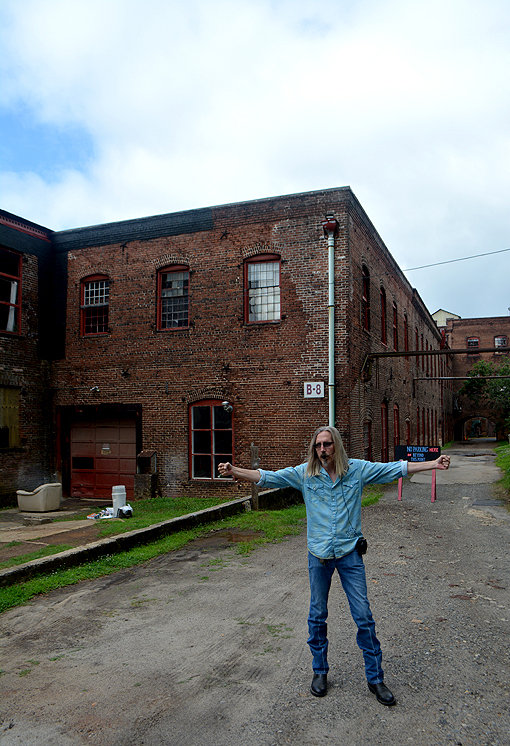 The shop is right across the street from many, many The Walking Dead filming sites, including the rooftop where Merle was chained in-wait of zombies. 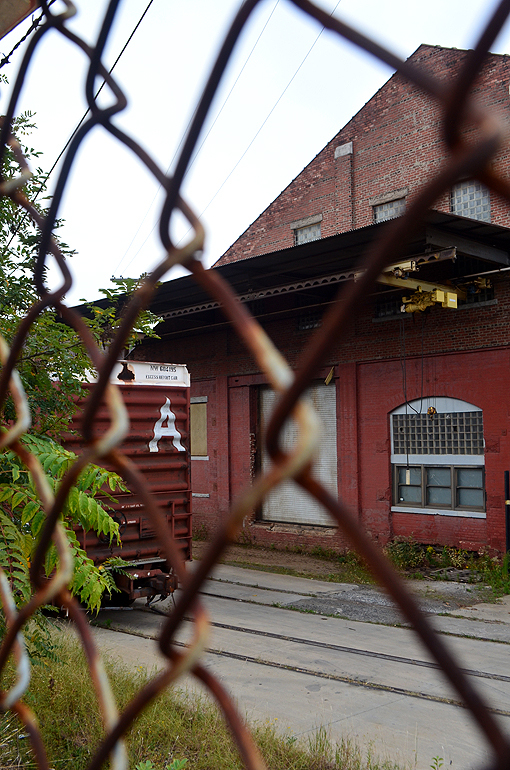 You may have heard about Captain America: Civil War also filming here recently. Lots and lots of movies are made here! There are so many scenes in movies that one never wonders about, because they're everyday places that could have been filmed anywhere. 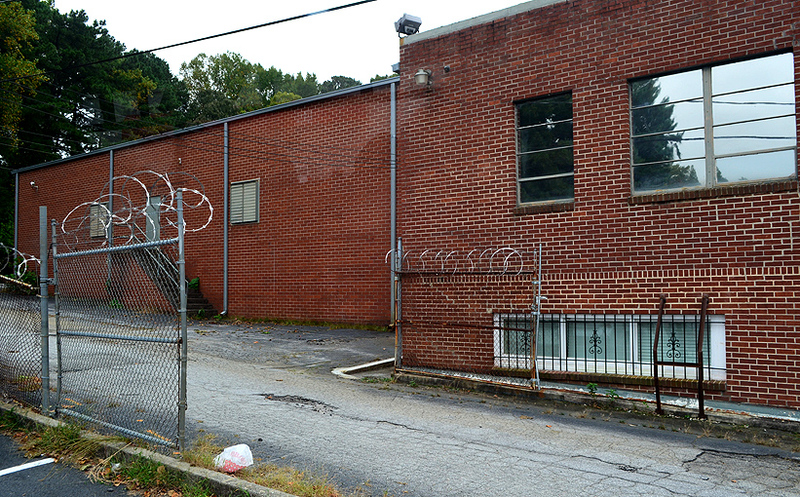 One of the awesome things about The Walking Dead is that so much of it has been filmed right here in Atlanta, and the surrounding area. The scene above was at the department store in Season 1, Episode 2—"Guts". I didn't crack the window...zombies did it. By the way, do you know what word in zombie nomenclature that The Walking Dead zombies are never called? Don't worry if you don't know...I was totally oblivious! You're going to learn so much! 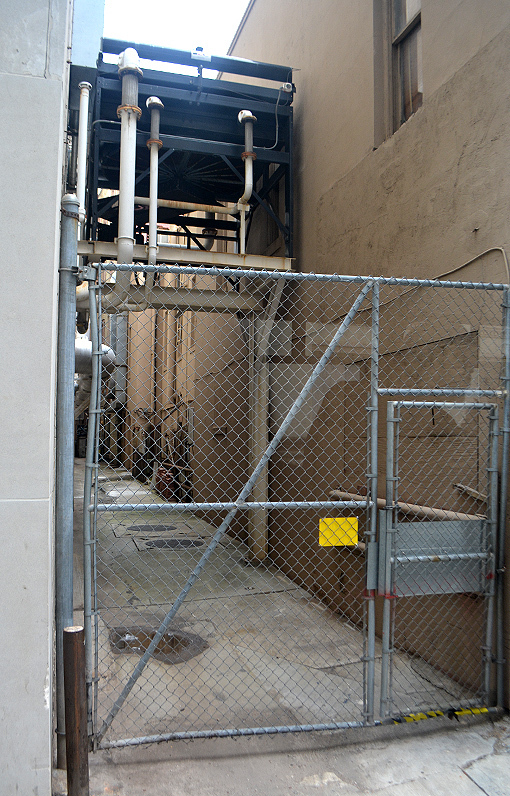 This site (above photo) is the alley, in downtown Atlanta, where Glenn rescues Rick after being caught in a tank with a zombie at the adjacent intersection. That zombie was portrayed by Sam Witwer, aka Crashdown of Battlestar Galactica, who I had the great pleasure of meeting at Dragon Con last year—and have a personalized autographed head shot to remember how awesome he is. I was blown away to learn how impressive his resume is! You'll hear more about that tank when I write about Big Zombie Tour - Part 2. Zombieland fans...Rule #2 was filmed near here! That's our tour guide Charlie and one-half of a British couple also taking the tour. I asked for this photo because the "hospital" behind them is where Rick woke up in Season 1, Episode 1 to discover zombies—first in the form of "corpsified" fingers trying to get through chained doors. It turns out that Charlie's fingers were in the running for inclusion in that scene...he could have been on that t-shirt! 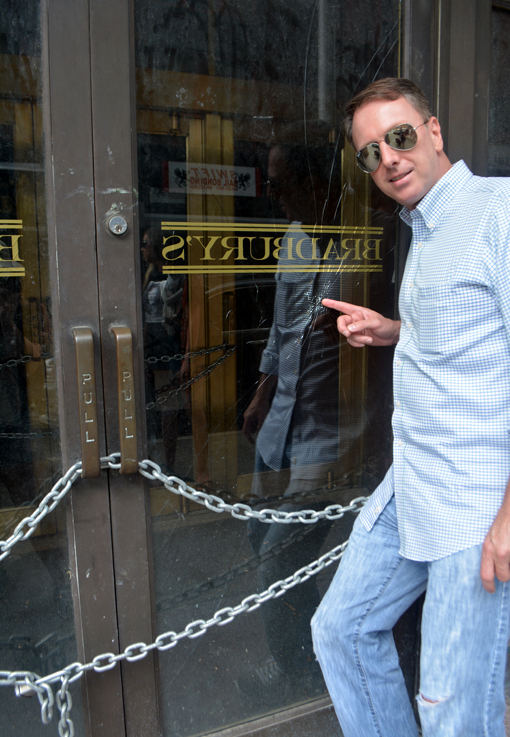 If you're a fan, you'll know the words inscribed on the double-door scene..."Don't Open, Dead Inside", or "Don't Dead, Open Inside", depending on how you read it. I got to chat more with that British couple later in the day (so sorry I didn't get their names!) and a couple of ladies from St. Louis. I love that about tourism...you never know who you're going to meet or from where they might hail. Having traveled to many places around the world (London one day soon, I hope), I'm fascinated with global cultures. Always have been. Terminus is where we meet Gareth (in the TV series) and also where we learn just what a badass Carol truly is. 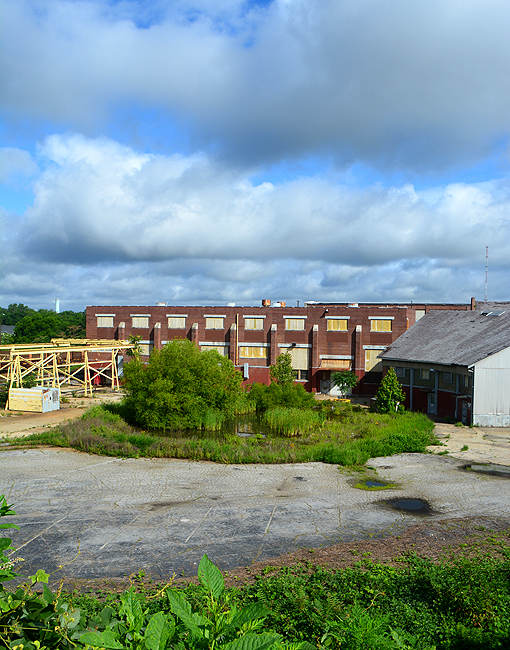 We couldn't get too close to Terminus, but got the total impact of what a great filming site this was. It's one of the stops where we got off the bus and had time to make as many photos as we wanted...and you can ask your tour guide questions any time during the tour—except for what the answer is to an in-play trivia question, of course. This is another filming site that happens to be right around the corner from my office. That's the case with a lot of Atlanta filming...you don't know how close you are! This is the King County Sheriff's Office where Rick and Shane worked. Just goes to show, you never know how close a zombie might be! I mentioned trivia. During the three-hour tour (now the theme song to Gilligan's Island is playing in your head, isn't it? ), your tour guide, with the assistance of the tour expediter, will conduct a trivia game—with prizes! Listen closely...they just might give you some of the answers during the tour. Just sayin'. That's our tour guide Charlie at another scene that I didn't specifically remember from the show, until they showed us clips from those particular scenes on the on-board video screens. That's right...these tours are so awesome that you don't have try to recall something you saw years ago (or last week) because they're reminding you with scenes on video from the episode being discussed. This is also the site of another well-known Atlanta-filmed movie that also happens to be the basis of an Atlanta Movie Tours tour...their Victory Tour. You find yourself walking in the footsteps of Rick AND Katniss! This was the second Atlanta Movie Tours tour that I've been on twice. On this particular tour there was another British couple (there were two British couples, traveling separately) that had been on this same tour two years before, so they could probably attest to what I'm about to share...Every tour is different. And that's a good thing. I learned things on this tour that I didn't on the first, but on the first we did go to the CDC, which of course has a fate that might not surprise you. But in case you haven't seen that Season 1 episode yet, I'll not spoil it with details. Speaking of the CDC and zombies, the CDC published some years ago a Preparedness 101: Zombie Apocalypse story that blast the website's hits far beyond what they could have possibly imagined, and conveyed important emergency preparedness information at the same time. I'm grateful as a citizen that they did this. The other Atlanta Movie Tours tour that I've been on twice is Margaret Mitchell's Gone With the Wind Tour. I've only seen the movie—the book is at the top of my reading list—and completely and totally enjoyed the tour, the second time as much as the first! Speaking of things changing between tours, we visited this site on both tours, but the "A" rail car, where some of our cast spends a little time, wasn't there on one of the tours—perhaps it'd been moved temporarily, I'm not sure. It was super cool to see, and what an iconic TWD image! PSA: Bring your camera! Bring a backup battery and an extra memory card. You're going to want to make a LOT of photos. There's so much I want to share about this AMAZING tour, but I have to save some (a lot) of it for your in-person tour...but, if you're lucky, you'll get to see "Carl Poppa". That's all I'll say about that. The photo above has so many movie moments in it. It's of course the iconic shot of when Rick was riding, horseback, into Atlanta in the first episode of The Walking Dead. 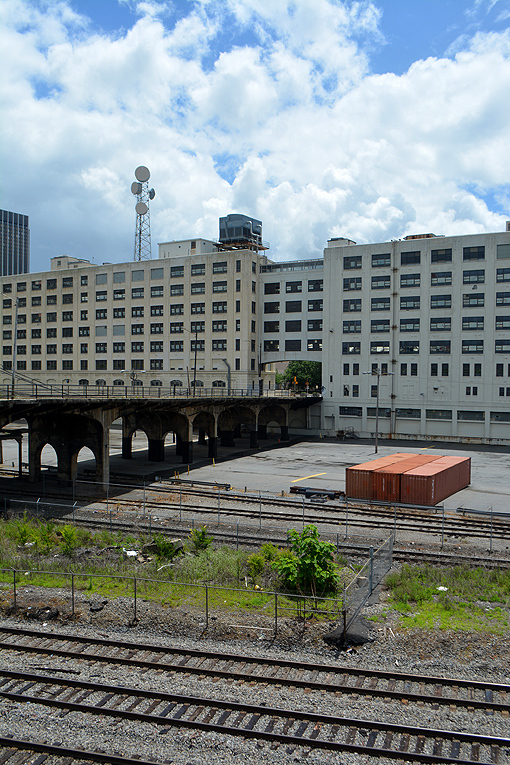 The "stepping stone" building on the left is the Georgia-Pacific Tower, which stands where the Loew's Grand Theatre once stood—where Gone With the Wind premiered. The highly reflective building immediately to the right of that one is the building that Rick saw the helicopter reflection in, in season 1. 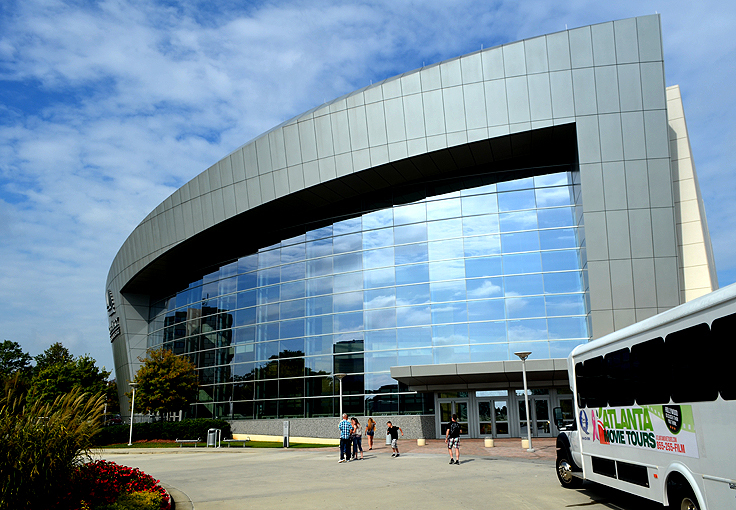 In real-life, it's named Centennial Tower—an impressive structure to be a 1970s building! The cylindrical high-rise toward the center is where an iconic scene in Sharky's Machine took place, although the actual stunt crashed through a window of a neighboring cylindrical building, a record-breaking stunt at the time. The filming sites of Atlanta-made movies goes on and on and on...many of which you can see on an Atlanta Movie Tours tour! Our awesome tour expediter, Megan, made this photo (above) for me. I met Megan on one of my first Atlanta Movie Tours tours and we immediately bonded...she's quite, but amazing. Thank you, Megan! Atlanta Movie Tours has been fantastic to me. They not only treated me to this tour as a media guest, but even more amazing is the friendship I've developed with the owners, Patti and Carrie. 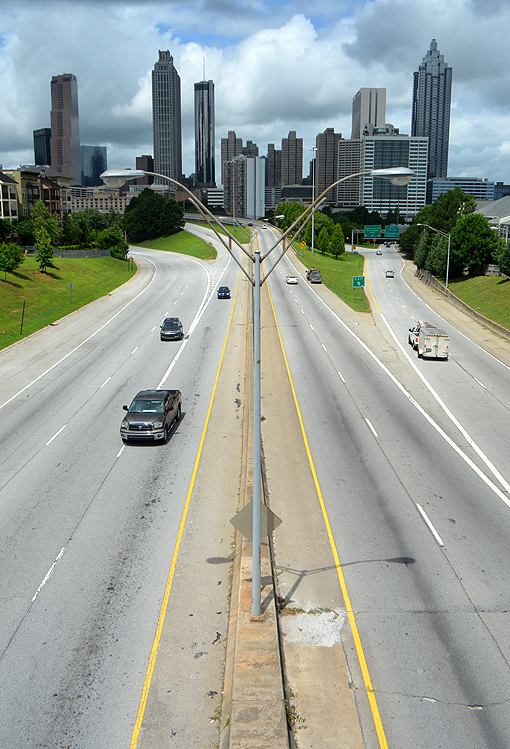 What they've done with Atlanta Movie Tours is nothing short of spectacular! And that they have amazing husbands, friends and fans speaks volumes of the wonderful people they are. I'm incredibly grateful for getting to know them and to call them friends...Love you, ladies! I haven't said much about Daryl and nothing about Michonne, but fret not. You'll hear more about them in my next post—Big Zombie Tour - Part 2! 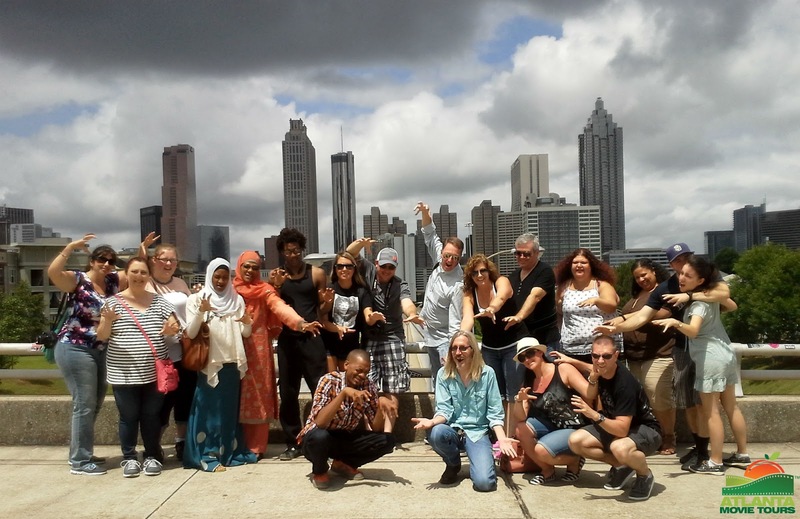 Book your Atlanta Movie Tours' Big Zombie Tour now! Part 1, or Part 1 AND Part 2 on the same day, or different days, but know that these tours sell out quickly. I met folks on both tours recently who were only able to get tickets to one of the tours because they didn't book early enough. Do both! Do both! So...much...zombie...fun! Thank you so much, Patti! What an AMAZING, AWESOME, FANTASTIC day! Thank you so much!